Osmanthus burkwoodii or burkwood osmanthus is a dense, evergreen and highly scented cross between osmanthus delavayi and osmanthus decorus. It has many properties in common with holly osmanthus (osmanthus heterophyllus). The most notable differences are that the burkwood osmanthus is early flowering (April-May) and even more fragrant than the holly osmanthus. Also, the burkwood osmanthus has finely serrated leaves that are not prickly. The extremely fragrant, almost jasmine-like white clusters of blooms are very attractive to bees and other pollinators and provide an early source of nectar. Burkwood osmanthus is rather slow growing (20-30cm p.a.) and is best suitable for lower hedges of up to 1.2m tall. 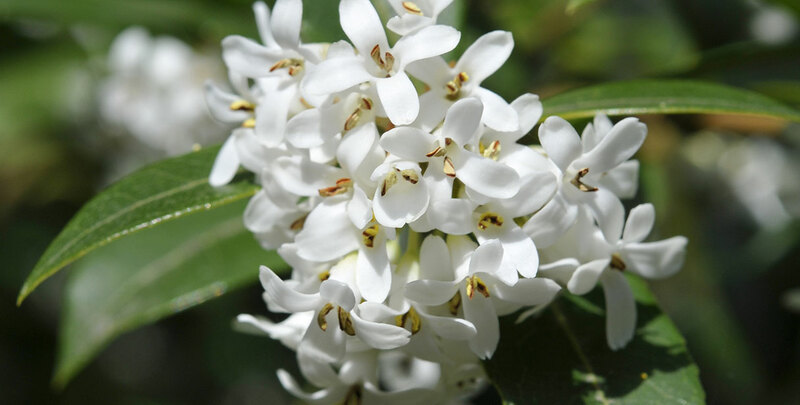 Osmanthus burkwoodii feels at home in full sun to partial shade in a fertile, well-drained soil that is preferably not too dry – keeping the soil moist is definitely recommended. The glossy dark green leaves make this plant a splendid evergreen, but it should not be planted in a position where it is exposed to strong winds or harsh winters. A sheltered position in sun or light shade is ideal. Minimal pruning is required, but we do recommend trimming osmanthus burkwoodii after flowering.